World Cup-winning coach Sir Clive Woodward says he would pick Wales wing George North for Great Britain's Olympics sevens team on current form. Rugby sevens will make its Olympic bow as a new sport at the Rio 2016 Games. "It's like you would pick a Lions team, you'd pick your dream sevens team and it's probably more difficult to pick a sevens team," Woodward said. 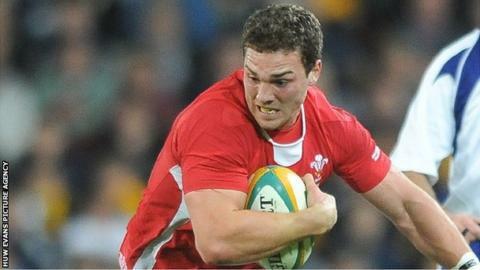 "George North would certainly make my Lions team at the moment. Would he make my sevens team, yes." Woodward led England to the 2003 World Cup and coached the 2005 British and Irish Lions tour to New Zealand, having also played for England and the Lions during his career. He took the role of director of sport for the British Olympic Association in 2006 and has helped manage TeamGB's efforts at Beijing 2008 and London 2012. Woodward told the BBC's Sport Wales programme that wing North, who is 6ft 4in and more than 17 stone, could even figure as one of the three forwards in an Olympic sevens team. They're big names but you're not picking them for their names. Can they play sevens? Can they go and win a gold medal? But he also warned that players from the 15-a-side game would have to dedicate time to the sevens game leading up to Rio 2016. "You're trying to pick this team, but he's got to play [sevens], you can't just put him in to that level. The fitness is a little bit different," Woodward said. "So certainly a year out, you'd like to think post-World Cup you're only 12 months away [from the Olympics] so a few players, a couple from each country, coming in. "They're big names, but you're not picking them for their names. Can they play sevens? Can they go and win a gold medal? "You obviously want to play in the World Cup, that's your big priority, but then to go to the Olympic Games as a sevens player if you're good enough would be a big, big tick for me. "We've got the structure there - it's good to see the quality of the coaches around - it is a different game to coach [than 15-a-side], it's a very specialised game to coach. "The real debate is, is it a specialised game to play in? Can you drop people in from the 15-man game just like that and compete at the top level? "Or do you need a specialist sevens player, playing at least two years out from the Olympics? "The Olympic gold medal is very valuable currency. "Anything is possible because this takes it to a whole new level and I'd like to think in Rio it'll be one of the big success stories. "There's no doubt this will help rugby hugely, but I think it's going to be a great Olympic event as well."